We’re in the part of the cycle where we just hunker down, waiting for piglets to be born, waiting for kids as well, waiting to incubate eggs, waiting to plant. Right now the only thing coming in is the feed bill. I’d like to make it a little smaller. I want to try fodder. Fodder is almost anything that’s harvested and brought to animals. Hay is fodder. Tree branches can be fodder. 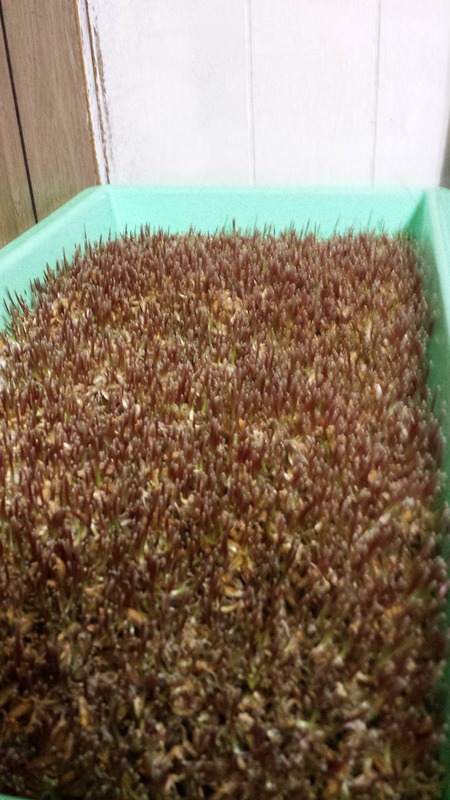 In this case, fodder refers to sprouting grain and feeding the sprouts to your critters. Barley is commonly used, but people use all kinds of grains/legumes. There are conflicting views about nutritional gain/loss. My thought is that sprouts are easier to digest than grain. This means that animals with one stomach won’t have to work as hard to get their nutritional needs met. If there is a nutritional loss, it’s probably not much. I’m betting that babies like just weaned piglets will get a big benefit. Did I mention that I can get barley for a lot cheaper than I can get feed? I’m paying about $520 for a ton of feed. A ton of barley costs around $200. Now, there’s stuff in my feed that isn’t in barley. I still need to give some feed. Experts say that for every 6 parts of sprouts I should have one part feed. This is still a big savings. Fodder systems add a lot of labor. I expect that a starter system will add 15 minutes to half an hour a day. So I’ll have to watch hidden costs like time. I bought a couple grow trays and a bag of rye. Why rye? Because I could find a small bag of it. I’ll be following up with barley and triticale. I was told that I could multiply the grain by three to get the amount I want in the end. I wanted 14 lbs of sprouts. That’s 4.7 lbs of grain to sprout. I rounded up to 6 lbs because I don’t trust experts who want to sell me stuff. I didn’t take a picture. I took 3 lbs of rye, threw it in the tray and poured some water on it. Just enough water that I got everything wet. I did the same for a second tray. Some of you are screaming that I did it wrong. I did this on purpose. I’ll talk about this at the end. To be clear, I did not rinse the grain first and I did not drain the trays. I added some water. I didn’t dump any out. No sprouts so far. The pic below does not do justice to the amount of fungus growing in the tray. The good news is that sprouts are visible. Once again, I added water. No draining occurred. Rye grass. Lots of fruit flies. I added a bit of water. No drain. Alcohol smell is evident. Fruit flies are very annoying. It’s obvious that the right tray isn’t doing as well. I think it might have had more water in it. I’m basing my opinion by look/smell. Fermentation has taken place. I added a small amount of water. Wow, both trays are sour. The left looks better than the right. I lost a pic or two, so you’ll have to trust me. 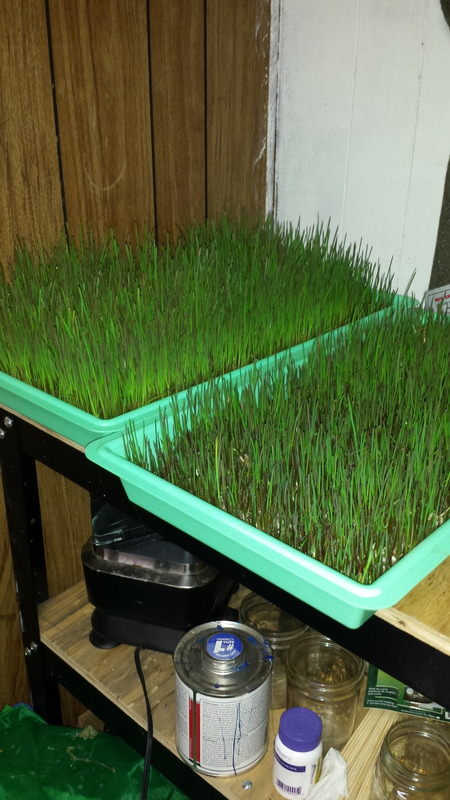 I had a mat of rye grass in the left tray. There were a lot of unsprouted seeds in view. The bottom of the tray was coated with them. The unsprouts were a tiny fraction of what I started with, but there’s improvement to be found. I would put less seed in the tray next time. There was a lot of unsprouted seed in the right tray. 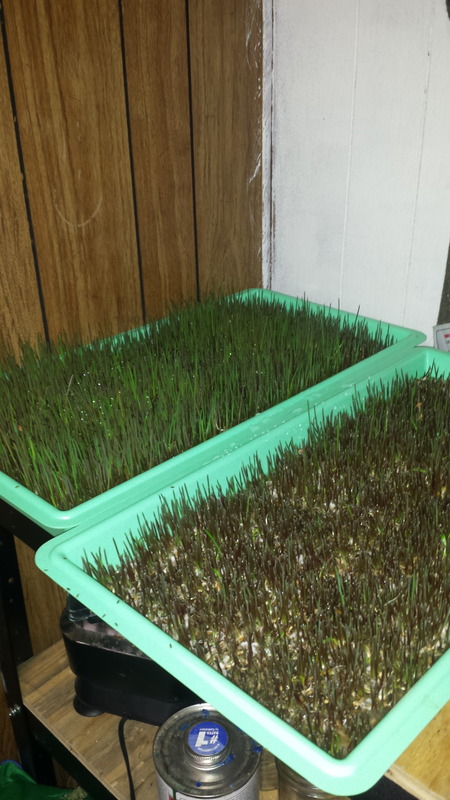 I didn’t have a true mat of rye grass–this came apart in clumps. There was a thick layer of unsprouted seed. I didn’t bother to weigh the sprouts. My interest is in how filling they are, not how much weight. I fed the left tray to my 70+ chickens. They fed for about half an hour. This is a really good sign. I get similar behavior from 7 lbs of feed. I also fed the right tray and noted the same time. I would have gotten less fungus if I had washed my seed before sprouting. It wasn’t a factor though. The fungus disappeared. The fruit flies were an annoyance. I think I could minimize them (as well as the fungus) with a well placed fan. 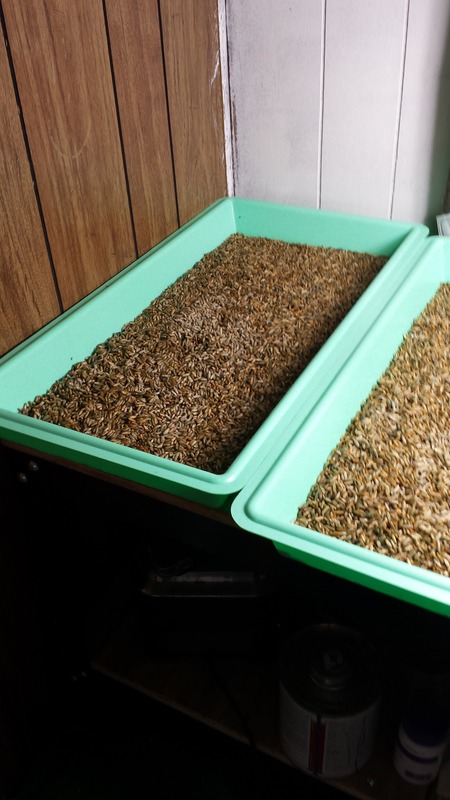 I should drain the trays after dampening the seeds. This will lower fermentation. I have some tuning to do with the amount of grain I put in the trays. Either way, this was a success. 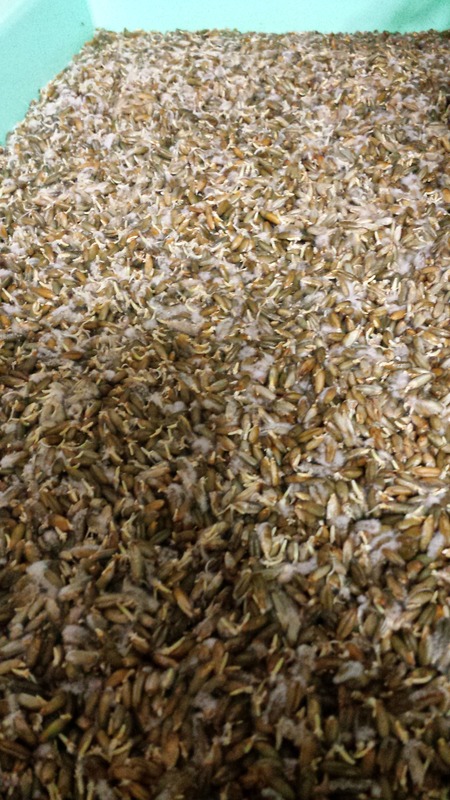 Even the fermented seed was not wasted–fermenting is a technique for making more of the nutrients available. My chickens were very happy to eat the seeds and the sprouts. I’ll try the triticale next. This entry was posted in Livestock, Poultry and Creatures Tame and Wild, Uncategorized and tagged barley, fodder, fodder system, rye, triticale by admin. Bookmark the permalink. Are you not worried about Mycotoxins? They’re a concern. I wouldn’t want wild fungus to be part of a steady diet. I definitely wouldn’t have fed my test sprouts to the chickens if I had seen any “fur” at the end of the test. I hope to mitigate fungus as well as the flies by 1) blowing air across the trays, 2) rinsing the seeds in a solution before sprouting them and 3) draining the trays after each soaking. I’ll do a better job of documentation when trying the barley and triticale. Keep up the good work! Love following your stuff!